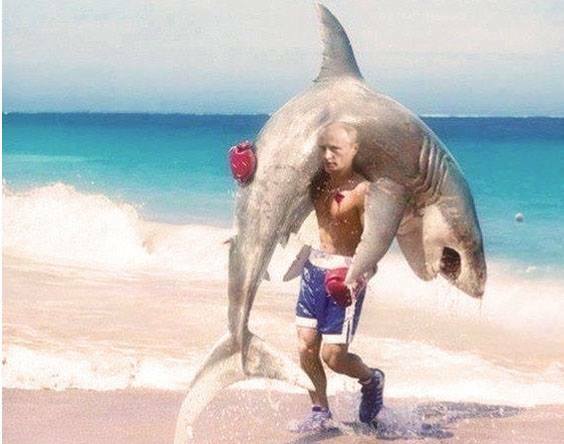 Moscow, Russia (ChristWire) – The Kremlin released a photograph of Vladimir Putin today, moments after he dove into an ocean and “beat the ever loving sh#$ out of a great white shark”, according to bystander Sergei Glasnost. Insiders say that Putin was steaming upset that Obama did not have the spine to bomb Syria and go to war with Russia. Shocked officials claim Putin dove into warm waters off the Syria coast late yesterday afternoon, audibly cussing as he couldn’t find any sharks to make his point. Frazzled and growing impatient, Vladimir Putin allegedly pulled a pocket knife from his swimming shorts and stabbed himself right in the heart so the ‘blood would be fresh’. With blood pouring from his body, Putin waited for a shark to approach him before ‘repeatedly crushing the shark in the head’. Several bystanders state they heard the shark physically cry and several young children closed their eyes tightly and held their mothers. Even several generals on scene begged for Putin to have mercy on the shark, which he dragged to shore by its ventral fin. The White House has not responded to Putin’s challenge at time of report. 5 Comments on "Russian President Vladimir Putin Beats Living Crap Out of Great White Shark, Dares Barack Obama to ‘Bring it On’"
And here I thought they where getting better at photo shopping when the new crappy people get here? This photograph I found on pravda.ru with the caption “President Putin beats a shark to scare Obama out of Syrian waters.” Pravda is the equivalent to New York Times in Russia. Strange how you didn’t include a link only the main site almost like it’s not real. Like anything on this site. No replay to that i see. So much going on did they shutdown religion too and that’s why no one here posts any more?